Lansing offers a debut novel about an ex–New York Police Department narcotics chief drawn out of retirement when drug-gang violence gets personal. Jack Bertolino left his hometown of New York City for Los Angeles after back pain sidelined him from the force. Since then, he’s been gardening and nurturing his penchant for red wine. Things change, however, when Mia, a gorgeous Colombian informant whom Jack knew intimately, turns up murdered. 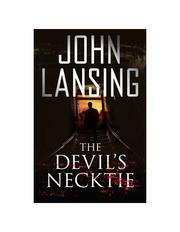 The brutal manner of her death, nicknamed “the Devil’s Necktie,” is a surefire sign that drug kingpins ordered the hit. The Los Angeles police initially suspect Jack but quickly clear him—and then rebuff him when he offers his help. He investigates the murder on his own, using his experience, instincts and invaluable connections from his cartel-busting days to unearth new evidence that makes the LAPD crawl back to him. He discovers a web of 18th Street Angels gang members, big-time Mexican and Colombian cocaine traffickers, and heartless criminals tied to Jack’s and Mia’s pasts. Lansing, a former writer for TV’s Walker, Texas Ranger and Scoundrels, crafts a compelling hero in Jack, who has a son at Stanford, an ex-wife back East, and classic tastes—including a fondness for Benziger wine, Miles Davis’ “Kind of Blue” album and his sterling gray Mustang GT. He has the appeal of a Hollywood leading man in the vein of Harrison Ford, particularly when romantic sparks fly with Deputy District Attorney Leslie Sager. The cinematic plot unspools at a smooth pace, cleanly shifting from one scene to the next and allowing readers to put the pieces together themselves. When action erupts, Lansing doesn’t hold back, and the explosive finale reads like something that blockbuster director Michael Bay might dream up. A pulse-pounding thriller with a charming protagonist.